AIGA SF is the San Francisco Chapter of AIGA, the professional association for design. The poster announces a lecture by noted author Ralph Caplan on the design of Charles and Ray Eames. 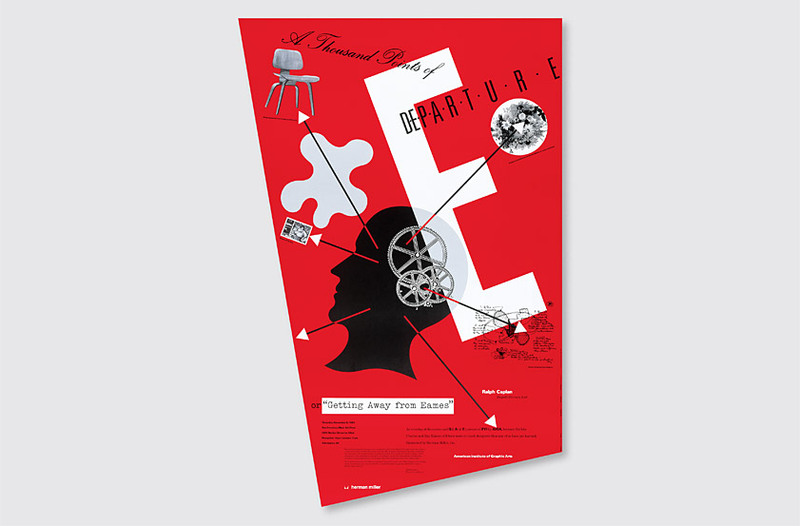 Our solution uses the Eames’ problem-solving methodology and seminal work in furniture, exhibitions, film, and graphics as “A Thousand Points of Departure” for the design thought process, inspiring designers to succeed in evolving design further, or “Getting Away from Eames.” The poster’s unique angled trim serves as a point of departure from the conventional rectangular poster shape.